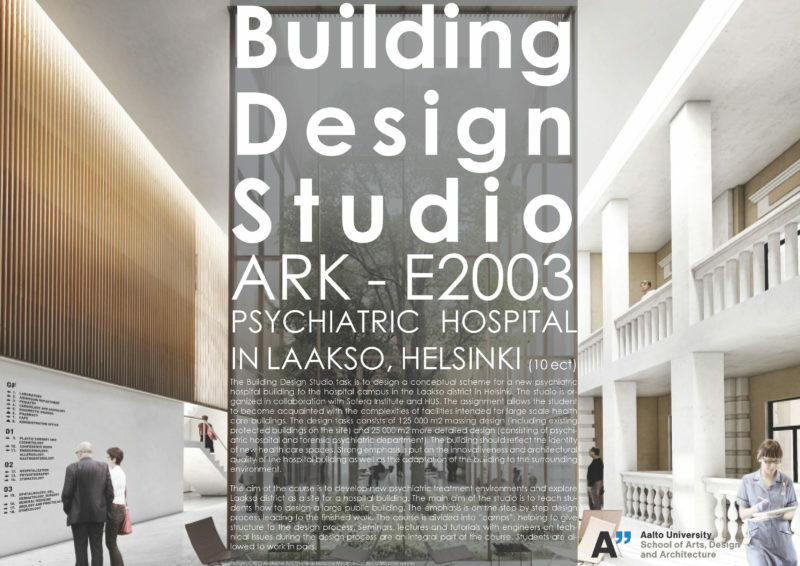 Group X is collaborating again with the Professorship of Building Design (Prof. Pirjo Sanaksenaho) in the studio course on the topic Psychiatric Hospital in Laakso (Helsinki), to be held at Aalto University Department of Architecture during this Autumn Semester 2017. The Building Design Studio task is to design a conceptual scheme for a new psychiatric hospital building to the hospital campus in the Laakso district in Helsinki. The studio is organized in collaboration with Sotera Institute and HUS. The assignment allows the student to become acquainted with the complexities of facilities intended for large scale health care buildings. The design tasks consist of 125000 m2 massing design (including existing protected buildings on the site) and 25000 m2 more detailed design (consisting of psychiatric hospital and forensic psychiatric department). The building should reflect the identity of new health care spaces. Strong emphasis is put on the innovativeness and architectural quality of the hospital building as well as the adaptation of the building to the surrounding environment. The aim of the course is to develop new psychiatric treatment environments and explore Laakso district as a site for a hospital building. The main aim of the studio is to teach students how to design a large public building. The emphasis is on the step by step design process leading to the finished work. The course is divided into “camps”, helping to give structure to the design process. Seminars, lectures and tutorials with engineers on technical issues during the design process are an integral part of the course. Students are allowed to work in pairs. Teachers: Pirjo Sanaksenaho, Sari Lehtonen, Fernando Nieto, Ville Hara, Toni Kotnik.